146 • RV PRO • September 2018 rv-pro.com B U S I N E S S RV PRO: So, this sounds like you had a disappointing session. Burton: It was disappointing because last year, which was a budget session, they said they couldn't address workforce issues because of all the fiscal matters they were dealing with. They would have to push it to a short session; and then during the short session they said we couldn't make major changes because it has to be during a budget year. RV PRO: Welcome to Indiana politics! Burton: Yes. RV PRO: Did you get anything of your agenda passed? Burton: We have assurances that we are going to go to a more employer-driven system. We are hoping the governor's new cabinet will focus on issues that will actu- ally move the needle and that it will not be just rehashing failed programs. RV PRO: Indiana is considered part of the "Rust Belt." Are Hoosier entrepreneurs investing in sufficient new plant and equipment so that some day Indiana might shed this ominous designation? Or has Indiana already done so, and the rest of the world just doesn't know it? Burton: We've done so. That term is misused. I wish we could take everyone that uses that term into facilities here in Indiana and show them the technology that is being used. It is high tech, it is very, very sophisticated operations, and it's manufacturing products not only for recreation but what is made here saves lives on a daily basis and makes lives better – whether it be orthopedic devices, whether it be pharmaceuticals and right down the line. A manufactured product touches every person, and many of those products are made in Indiana. RV PRO: A study by the Indiana Economic Development Corp. found that after the Indiana Legislature passed right-to-work legislation in 2012 some 12,000 jobs were created and more than $1.2 billion in invest- ment was made by companies that said they chose Indiana because it was a right-to-work state. Would you side with the IEDC's take on this? Burton: Absolutely. As I mentioned, we have created a very positive business climate in Indiana. In talking with site selection professionals, we were losing out on over one-third of all opportunities out there because we were not a right-to- work state. We could not get past that first hurdle to even explain the benefits of our business climate. That barrier, once we passed right to work, was taken down and now we are seeing the investment in the jobs created. 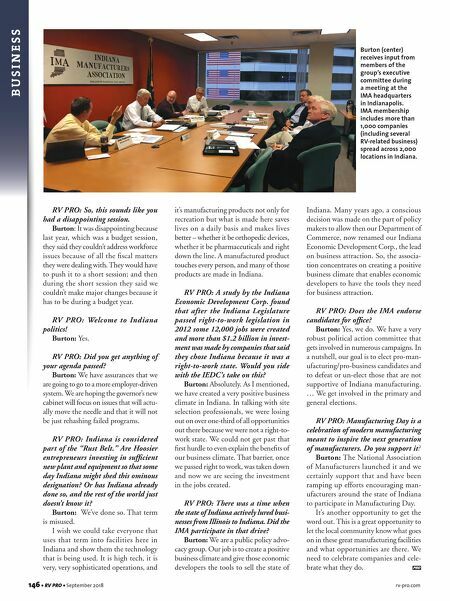 RV PRO: There was a time when the state of Indiana actively lured busi- nesses from Illinois to Indiana. Did the IMA participate in that drive? Burton: We are a public policy advo- cacy group. Our job is to create a positive business climate and give those economic developers the tools to sell the state of Indiana. Many years ago, a conscious decision was made on the part of policy makers to allow then our Department of Commerce, now renamed our Indiana Economic Development Corp., the lead on business attraction. So, the associa- tion concentrates on creating a positive business climate that enables economic developers to have the tools they need for business attraction. RV PRO: Does the IMA endorse candidates for office? Burton: Yes, we do. We have a very robust political action committee that gets involved in numerous campaigns. In a nutshell, our goal is to elect pro-man- ufacturing/pro-business candidates and to defeat or un-elect those that are not supportive of Indiana manufacturing. … We get involved in the primary and general elections. RV PRO: Manufacturing Day is a celebration of modern manufacturing meant to inspire the next generation of manufacturers. Do you support it? Burton: The National Association of Manufacturers launched it and we certainly support that and have been ramping up efforts encouraging man- ufacturers around the state of Indiana to participate in Manufacturing Day. It's another opportunity to get the word out. This is a great opportunity to let the local community know what goes on in these great manufacturing facilities and what opportunities are there. We need to celebrate companies and cele- brate what they do. Burton (center) receives input from members of the group's executive committee during a meeting at the IMA headquarters in Indianapolis. 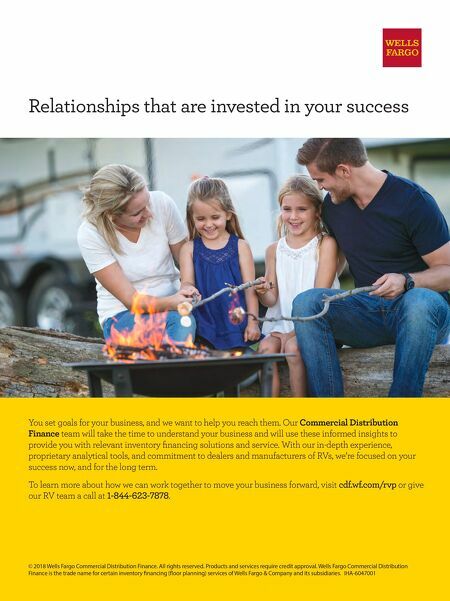 IMA membership includes more than 1,000 companies (including several RV-related business) spread across 2,000 locations in Indiana.